In an email interview with Mongabayl, Professor Laurance said, “I cannot imagine anywhere else in the world where a project like this would even be seriously entertained. “The Batang Toru project will slice its [Tapanuli orangutans’] tiny remaining habitat in half via the roads, power-line clearings, and massive pipeline required for the project, along with flooding some prime habitat for the ape”, he said. Announced in 2012 and due to be finished by 2022, the US$1.6 billion Batang Toru hydropower project, funded largely by the Bank of China under the direct authority of Chinese President Xi Jinping, will be built Sinohydro Bureau 10 Co. Ltd, a subsidiary of China’s state-owned hydropower enterprise Sinohydro. 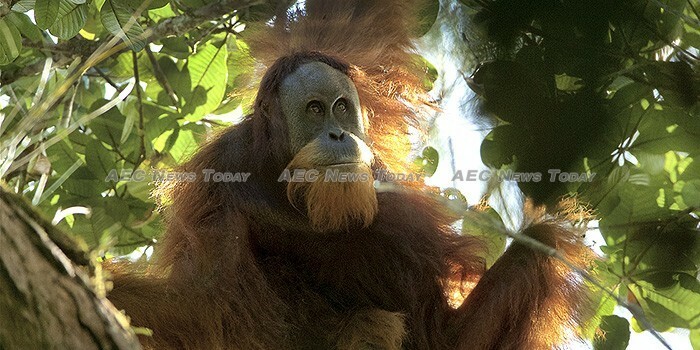 Other major sources of finance such as the World Bank and the Asian Development Bank (ADB) have withdrawn their pledge to underwrite the Batang Toru hydropower project, citing the Tapanuli orangutans’ habitat as being too sensitive to undergo more development as one reason. On July 10, 25 of the world’s top environmental scientists lambasted plans to proceed with the Batang Toru hydropower project in a letter addressed to President Joko Widodo, hand-delivered to the office of the president’s chief of staff. According to Dana Prima Tarigan, executive director of the North Sumatra chapter of the Indonesian Forum for the Environment (Walhi), the Batang Toru hydropower project will occupy 6.45 square kilometers (2.5 square miles) of land along the Batang Toru River in South Tapanuli district, making it “the largest hydropower plant on Sumatra”. By May, more than 50 hectares (124 acres) of forest had been cleared for the project, with Mr Tarigan saying that each month the forest clearance rate intensifies. Activists from Walhi protested against the construction of the Batang Toru hydropower on May 8, calling on the Chinese government to withdraw its funding for the scheme, described as a part of China’s Belt and Road Initiative (BRI). Environmental pressure groups such as AVAAZ and World Wildlife Fund (WWF) are teaming up to rally support to save the remaining 800 Tapanuli orangutans, who are said to have seen their population shrink by some 83 per cent over the course of three generations due to logging, mining exploration and exploitation, small-scale agriculture, and oil palm plantations. An online petition addressed to the Indonesian government and President Joko Widodo imploring them to cancel the Batang Toru hydropower project has so far attracted more than 1.3 million signatures, out of a goal of 1.5 million. Indonesia has faced intense criticism in the past over its approach to the environment and animal rights. Last year a disturbing video made the rounds on social media depicting malnourished sun bears confined to filth-crammed concrete enclosures, scampering for food thrown from visitors at Surabaya Zoo (See: Indonesia ‘Death Zoo’: President Widodo Petitioned to Save Starving Sun Bears at Bandung Zoo), which in the past has bene labelled the ‘death zoo’. In 2013 photographs of a gaunt, malnourished, and dispirited Sumatran tiger named Melanie’, also at Surabaya Zoo, shocked veterinarians and wildlife conservationists globally, who battled endless bureaucracy in an attempt to have her removed from the zoo for treatment elsewhere. Despite a petition resulting in ministerial intervention and treatment, ‘Melanie’ died on September 2, 2014; She was 15-years-old. There are thought to be less than 400 Sumatran tigers remaining in the wild.